The most significant period of labor unrest in British Columbia since 1983 took place in late April and early May of 2004, as a result of the failed province-wide “General Strike” movement. During this period, dissatisfaction with government policies and ensuing legislation escalated into wildcat strikes, walkouts, and significant mass public support for the actions of labor unions, community groups, and students in opposition to the government. Very little has been written on the attempted general strike from the perspective of those in British Columbia, and even less from those who were actually involved in the actions that took place around May Day of 2004. The lack of critical theory and analysis of what happened is unacceptable in light of the current situation, and the challenges faced not just by working people throughout the province, but also across the country. Without a thorough understanding of how the general strike movement operated, and how it failed, the labor movement in British Columbia will be sentenced to continual failure and decline. Even worse, it would be a tragedy if the Quebec workers, who even now are wrestling with the neo-liberal reforms of the Charest Liberal regime, were not to draw solid lessons from the general strike movement. This critical account of the failed general strike movement in British Columbia is written from an anarchist perspective within the events, as both a participant and observer. Analysis of the event is firmly rooted not only in experience of the events at their epicentre in Victoria, but also from the perspective of an anarchist-communist and student union organizer involved in labor and community struggles. It is therefore necessary that the content of this account focus on the events in Victoria, the most central area, both because it is the provincial seat of governance, and because the city experienced the sharpest expression of class conflict. There are four general sections to this account: a brief introduction to the history of labor unrest leading up to failed general strike, a precise description of those events, a critical analysis of the situation as it emerged, and some conclusions for the labor movement in general and revolutionary left in particular. British Columbia has traditionally held one of the strongest labor movements in North America. This may seem to be a surprising and controversial contention at the outset, but to those well versed in labor and radical history, the conclusion is not without merit. Many US trade unions found their origins in the Pacific west above their borders, the Industrial Workers of the World established a stronghold prior to their suppression following the first world war, and the solidly resource-based economy has long been a bastion of unionism, in both the public and private sectors. Although these foundations have continually been eroded, their legacy still remains in the unique manifestations of the labor movement today. It was during the late reign of the conservative Social Credit government, prior to the accession to power of the social-democratic New Democratic Party (NDP), that the labor movement found expression in the 1983 “Operation Solidarity” movement. The culmination of radical organizing throughout the late 60's and 70's, Operation Solidarity saw labor, community, environmental, and radical militants attempt a general strike to force the hand of the provincial government. This was the first crucial battle between the introduction of neo-liberal privatization, and a labor movement divided between reformism and radical opposition. Operation Solidarity later earned the title “Operation Sold Out”, as the powerful anti-communist labor bureaucracy ceded into a deal with the government on unfavourable terms, ending the mass labor dispute. With the fall of the NDP in the election of 2001, in which it lost all but two of the seventy-nine electoral seats up for contest, a radically right-wing regime under the BC Liberals took power provincially. The effects were immediate and striking. Where the NDP has eroded the foundations of the welfare state and enacted policies aimed at privatization and liberalization of industry, the BC Liberals outright crippled and destroyed the social order that had existed during the previous social democratic government. The terms of labor contracts concluded by mutual parties were openly altered by legislation, unions who expressed contempt through labor action were legislated back to work, and social welfare services were slashed as massive tax cuts for the wealthiest citizens came hand in hand with the privatization of public assets. In January of 2002, the provincial government introduced legislation specifically aimed at provoking the British Columbia Teachers Federation (BCTF) into open conflict, and breaking the Hospital Employees Union (HEU). The legislation “renegotiated” existing contracts into unilateral documents based solely upon the will and discretion of the government. Other unions, such as the British Columbia Government Employees Union (BCGEU), faced massive wage and benefit cuts in addition to the layoffs experienced as a result of broad public-sector privatization. In all cases, the leadership of the unions ceded to government demands without a fight, relying primarily on mass one-off publicity demonstrations of public displeasure. It was in this climate of social tension and defeatism amongst the union bureaucracy that substantial radical elements began to take more definite form and express themselves popularly. During large anti-government demonstrations, anarchists and assorted radicals began to distribute literature and carry banners calling for a general strike, demanding measures aimed at rolling back the provincial government's policies. Community coalitions that served as alliances between labor and community militants were formed, often as small directorships unaccountable to broader external or internal social forces, to carry out social agitation the British Columbia Federation of Labour (BCFed) refused to sanction. Consistent polarization within the people's opposition to the government ensued as the BCFed and affiliates adopted a position of waiting for the upcoming provincial elections to alter government policies through election of a social democratic alternative. Recalling the openly neo-liberal policies of the prior social democratic government, radicals broadly rejected the NDP and BCFed's line and continued to push for a general strike movement. The provincial government decided to launch an intensified attack on the HEU early in 2004, announcing privatization of over 1,000 positions on Vancouver Island alone. The largest private sector union in the province, the Industrial, Wood and Allied Workers of America (IWA), backed up the privatization schemes by unionizing the employees hired by companies who were recipients of the privatization contracts. With no legal recourse, since the “new” workers (in reality, primarily the old employees forced to take the same jobs at lower pay and benefits) were covered by labor law as belonging to the IWA, over 10,000 HEU workers were about to or had already lost their jobs. 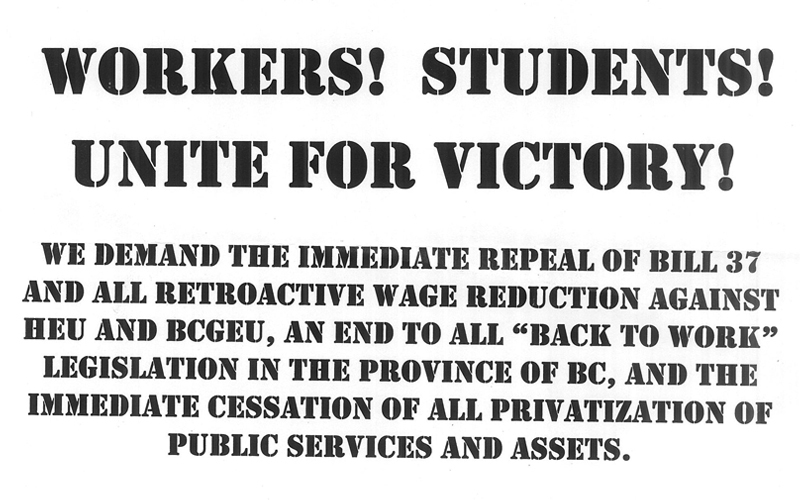 On February 23rd, the Communities Solidarity Coalition of Victoria (CSC) supported a wildcat strike action by many of the HEU workers whose jobs were slated to be privatized. Student union militants played a sizable role in supporting the wildcat. The CSC, which had previously focused on mass demonstrations and social actions, now focused itself on supporting HEU workers who were under attack. The CSC was itself at the time a loose coalition of labor, student, and community activists led by a small group of organizers. The health employers, backed by the provincial government, took an aggressive position in ensuing contract negotiations with the HEU. Confidently backed by the government, the employers demanded severe cuts in benefits and pay that were rejected outright by the HEU's membership. The result was that in April, contract negotiations failed, and on Monday, April 26th the HEU went on strike at approximately 340 care facilities around the province. The union took a steadfast position in maintaining essential service levels at all health care facilities, allowing for required treatments to continue and necessary shifts to be staffed by its membership. From the outset of the strike, public opinion was mobilized in favour of the HEU workers, with labor and community activists actively joining the picket lines. The government's response was swift, and after just two days into the strike, they crafted Bill 37 to legislate the HEU workers back to work. In addition to ordering strikers back to work, the legislation fixed a contract for the union that allowed for open-ended privatization, and imposed a 15% wage cut retroactive to April 1st. Supporters of the HEU rallied to the picket lines in indignation, and labor and community activists began to encourage wildcat pickets in support of the striking workers, urging the union not to give in to the government's position. The labor movement was deeply divided on the legislation: while all opposed it, some prominent unions and labor leaders refused to support the HEU. Jim Sinclair, president of the BCFed, held back from advising labor unions to join the HEU on the picket lines, and the head of the BCGEU did likewise. During the morning of Thursday April 29th, before Bill 37 had been given royal assent and passed into law, shop stewards for the BC Nurses Union (BCNU) and Health Employees Association (HEA, a loose BCGEU affiliate) were ordering their members to cross HEU picket lines. The HEU executive itself didn't issue a decision on the government's ruling until over a full five hours after it had been made law, eventually declaring they would continue the strike in defiance of the government. To provide some context, the BCFed is the overarching labor federation that unites the majority of public and private sector unions in the province. The BCGEU is a smaller yet influential public sector union within the BCFed. Lacking clout at local levels (and even within the Victoria labor movement), the BCGEU holds considerable power within the BCFed and was responsible for many of the conservative directions taken by the organization. The decision by the HEU, under strong pressure from its members, to defy the government's back to work legislation was both a controversial and popular one. While many unions such as the BCGEU and BCNU distanced themselves from the HEU and ordered members to cross picket lines, workers across British Columbia began to decide otherwise. Over 100 BC Hydro workers in Prince George and Revelstoke went on a wildcat strike, shutting down the three largest hydroelectric dams in the province. Several union locals across the province followed suit and went on strike in support of healthcare workers, and HEU picket lines were flooded with supporters from the community and other labor unions. CUPE locals started repeating the call for the general strike, by this time a common slogan, and the BC Teacher's Federation (BCTF) declared their members would respect any and all CUPE picket lines around public schools. Support from CUPE locals in Victoria was especially critical, as many defied ordered delays and went on wildcat strike immediately. The morning of Friday, April 30th started with a bold action by the CSC, pre-empting a labor board ruling deeming the strike illegal. Leading militants from the BCGEU, CUPE, HEU, and student unions staged a flying picket of the Victoria Swartz Bay BC Ferries terminal, effectively shutting down the main conduit of travel between Vancouver Island—the capital of the province being located on the Island—and the mainland between 5:30am and 7:20am, disrupting sailings for the rest of the day. Although the action itself was minor, the BC Ferry workers themselves enthusiastically supported the picket lines, and news of a flying picket shutting down a crucial transport corridor spread quickly throughout the province. Throughout Friday, union locals across the province continued to wildcat in support of the defiant HEU workers. In Victoria, almost every CUPE local went out in support of the HEU, with the exception of the University workers. Largely, CUPE workers were enacting a solidarity “Action Plan” of cascading strikes should any of its subsidiary locals be targeted. While HEU wasn't affiliated with CUPE provincially, it was nationally, and therefore many individual locals interpreted the “Action Plan” liberally and enacted solidarity strikes. CUPE's leadership, which hadn't yet issued a strong position on the strikes, came out in support of them and announced that all of the union's 70,000 workers in the province would be out on the picket lines by Monday at the latest. The BCFed, meanwhile, had scheduled a meeting with the government's Labour Minister. The talks were short, with the BCFed pulling out quickly to caucus internally. The rest of the day was consumed by internal meetings of the BCFed, where the organization secretly decided not to authorize a general strike, the executive voting against the measure by a small but safe margin. The BCFed's decision was impacted by a serious problem: the general strike movement which was building steam had not been initiated or planned by the organization itself, whose leadership was clearly in the passenger seat. Over 800 BC Hydro workers joined their brothers and sisters on the picket line, and all across the province the movement for a general strike was gaining steam. Saturday was May 1st, International Workers’ Day. Demonstrations in commemoration of the eight-hour-day struggle and international labor solidarity flared around the globe, as they do every year on that day. In Victoria, over a thousand striking workers and militants took to the streets, periodically interrupting speakers with chants of “General Strike now!” and marching directly to picket lines in support of striking HEU workers. Thousands of leaflets denouncing the government and distributing demands were issued under the banner of the Federation of Northwest Anarchist-Communists (FNAC). The leaflets, the only broad propaganda issued during the May Day demonstrations, featured common demands such as repealing back to work legislation and calling for a general strike. In population-dense Vancouver, a hastily put together May Day demonstration attracted over ten thousand marching in support of the general strike movement. Labor unrest around the province increased. More and more unions continued to wildcat off the job, in a seemingly endless cascade. Over 24,000 students were unable to attend the schools which had been shut down by CUPE pickets, and flying squads in Victoria picketed several sympathetic union locals. The provincial government was appealing for unions to “respect the rule of law” and continued to seek a court injunction against the strike, which had been deemed illegal. In addition, plans were set into motion to conduct mass arrests, and holding facilities were emptied in expectation of striking workers being rounded up. It was in this climate that the BCFed, still reeling from its membership rejecting appeasement tactics, decided to convene further negotiations with the government. The expected “calm before the storm” arrived on Sunday, May 2nd, after a series of May Day demonstrations that had buoyed striking workers and left the government and BCFed alienated from the events taking place. Provincial courts declared the HEU strike illegal, and levelled severe fines against the union in excess of $400,000 a day. Despite the stiff penalties, the HEU stood firm and refused to remove its picket lines. The United Food and Commercial Workers (UFCW) had by this time served strike notice, threatening to take down large sectors of commercial food distribution services. Private sectors unions, including progressive locals of the IWA, announced they would walk out on Monday. Transit workers across the province also stated their intentions to go on strike in support of the HEU. The BCFed sought to regain composure and announced to leading labor and community militants a plan of action for the anticipated province-wide general strike on Monday, refusing to acknowledge the organization's executive had already decided against calling a general strike. In Victoria, a meeting was arranged between local BCFed affiliates and local militants, primarily from the CSC, outlining which locals could and could not be picketed down on Monday. Meanwhile, closed door negotiations between the government and labor leaders continued. By Sunday night the CSC had grouped labor and community militants together in Victoria for a planning session to work out details of the following day’s activity. The session quickly began to unravel as news reports of an agreement reached by the highest echelons of organized labor had been accepted. The BCFed, it appeared, was using its chain of command to dismantle preparations before negotiations with the government had produced any results. It appeared to all observers that the BCFed had no intention of allowing its affiliate membership to strike, a suspicion that was confirmed with the cessation of approval for the CSC in Victoria to cross-picket an extensive list of sympathetic work sites. After 10:00pm, news of the sellout by labor leadership was announced: a deal had been reached between the HEU management and the government, brokered by the heads of the BCFed and BCGEU. CUPE quickly ordered its membership to stand down, and the BCTF followed suit, along with the other public and private sector unions. Amongst the general confusion of the ensuing series of pronouncements by labor leaders, HEU workers at locals across the province denounced their executive, openly accusing the leadership of “selling out”. Indeed, the “deal” negotiated with the government merely reduced pay cuts to 10% while adding 2.5 hours to the work week, limiting privatization of positions to “only” an additional three hundred. Visibly defiant, HEU workers across the province announced to live television crews their intention to stay on the picket line, and pickets were quickly erected around HEU headquarters by a dissatisfied membership. The morning of Monday, May 3rd saw HEU pickets remain steadfast at the major health care facilities across the province. In Victoria, over 400 FNAC posters were plastered across the city demanding the repeal of Bill 37 and cessation of privatization of public services and assets. Flying pickets shut down transit services, and CSC flying squads were centrally coordinated around the city. In Nanaimo and Quesnel, labor unrest continued throughout the day. Despite this strong show of forces on Vancouver Island, the mainland remained relatively quiet. Business as usual resumed in Vancouver, where no CSC-like group was able to coordinate cross pickets or flying squads, and the labor movement obeyed the back-to-work orders. Even in Victoria, it was clear by the end of the day that the general strike movement had been crushed. The unions had backed down, some publicly denouncing the deal with the government, others sheepishly claiming it as a “victory”. The HEU, betrayed by its own leadership, soon caved and found itself engaged in pitted internal battles. The general strike movement was, for all intents and purposes, over. It is exceedingly difficult to arrive at a coherent, systemic analysis of the failed general strike movement in British Columbia. There is an intersection between reality and ideological interpretation that blurs lines, and leads to false motivations being ascribed to various parties. The tendency to describe complex socio-economic forces in simple, dogmatic stereotypes is all too common amongst the revolutionary left. In much of the material that has already been published, “big labor” is accused of selling out “the rank and file,” without any further exploration of the issue, or clarification of what those two terms really mean. Rather than using facts to justify an ideological explanation of the situation, the following analysis of the general strike movement attempts to use ideological conventions to illuminate the currents of factual understanding. First and foremost, the single greatest reason for the failure of the general strike movement was a lack of organization. The most glaring, obvious deficiency in the way in which the rolling wildcat strikes were conducted was the fact that the various locals going on strike were rarely in communication with one another. Since the structures of the formal labor movement across the province were unable to provide leadership or coordination, labor and community militants were left to their own devices, along with whatever smaller coalitions they had formed in the previous months of struggle. This level of organization was, by itself, insufficient to coordinate and provide leadership for the broad elements calling for a general strike. In the absence of organically developed leadership, many elements looking to underdeveloped and unaccountable formations with little in the way of developing political stance, or worse yet put radical aspirations in the hands of the conservative BCFed. There were no common organizations in which labor and community militants could come together to confide in one another in a time of crisis. The leadership that arose throughout the April and May events was accountable in a very loose way in several instances, and completely unaccountable in several more. The groups of militants who could, and should, have been issuing demands and organizing increased strike action were paralysed by inaction, and found themselves swept up in the events that unfolded before them. When the need for greater organization became apparent, it was already too late. There is a continual tendency among radicals to create social movements that are inherited by reformists, and either crushed entirely or used for the ends of the latter. This is precisely the case with the general strike movement. The loss of these movements to reformist elements is never intentional, nor is it the result of indecisive elements within the radical tendencies; rather, it is the natural result of radicals not being engaged in specific political organizations. The CSC is a perfect example of this: while many of its leading militants identified with revolutionary traditions, including anarchism, few of them were engaged in any specific political organizations. The task of building a culture of resistance among common radicals was ignored in favour of exclusive work on mass political formations, brought together around a simple basis of unity. Formations of this type lack a basic understanding of the environment in which they operate, and fail to differentiate between experienced militants and casual participants. While these mass formations are necessary, and indeed crucial to any social movement, by themselves they lack the sophistication to develop beyond mere reformist agitation. Nowhere in the province was a single political organization or alliance of organizations able to broadly influence the course of events, with the result that a series of competing organizations exercised slight influence over small factions within the broader movement. The movement itself, based on a loose notion of defending the HEU by wielding the tool of a general strike, was unable to shift tactically or even strategically. While militants had, through their agitation, shaped the desire for a general strike and brought it to the forefront of public consciousness, they had simultaneously failed to create organizations that could ensure the practical application of the principles from which the desire for a general strike stemmed. The membership of several local unions after the fact would complain that because of a lack of organization, and as a result a lack of communication, they were unaware of the extent of resistance to the BCFed-brokered “deal”. They contended that, had they only been informed of the ongoing resistance and its depth, they would have rallied harder around the need to continue the strike. The lack of counter-structures being developed to spread information allowed for the default organizational structures of the BCFed and affiliate unions to take over processes that had, for the duration of the General Strike movement, been suspended by the self-activity of the strikers and their nominally militant leadership. The role of flying squads was critical in shaping the character and direction of the strike movement. In many union locals, there exists a tension between the reformist and more radical elements. Flying squads allowed the radical elements to unite and draw out the reformist elements with them, by changing the dynamic from “should we walk out?” to “should we respect an existing picket line preventing us from going to work?”. While a “yes” to the former question was often indefensible in the face of strong reformist control of a local, a “yes” to the latter was resisted by only the most conservative elements. The main lesson that can be drawn from the failure of the General Strike movement in BC is the need for a coherent revolutionary organization with a solid theoretical and practical base. It is the theoretical wealth of an organization, especially a revolutionary organization, that determines its ability to influence militants and provide a common vision and direction that can be followed by a broad number of people. It is the practical base of an organization, and the connection of its membership to the struggles they are attempting to influence, that form the ability of the aforementioned theoretical analysis to permeate and gain popularity among existing militants (while in its propagation awakening new ones). If the revolutionary anarchist-communist movement is to learn anything from the failure of the General Strike movement in BC, it should be the need for solid theoretical analysis that lays out the path before those involved in agitation, and provides a common basis for militants from all ideological tendencies to unite under. Agitation in a given area of struggle – be it based in the community, industrial, or service sectors – by itself does not produce the required level of communication and organization to build a movement that can truly make itself independent from the reformist structures it arises within. The level of organization needs to come from militants grouped together around a common analysis of the situation, who work out their respective ideological positions on the basis of the analysis being put forward. Concretely, in any future general strike situation in BC or Quebec, the immediate task of a revolutionary organization can be characterized in three main areas. The first is to carry out broad and systematic propaganda campaigns on behalf of the labor agitation, which FNAC did during the BC movement and NEFAC has apparently done during the Quebec labor disputes. The second is to form a theoretical analysis of the situation, to provide a vision of where the movement should go based on that analysis, and to propagate both the vision and analysis broadly throughout the movement. The third area of intervention is to develop and raise existing organs of struggle to an appropriate level where they do exist, and to build and maintain them where they do not. Integral to this process is identifying a community organization which can be developed to serve as a conduit for communication between existing labor unions, and facilitating meeting between the leadership from various community groups and labor unions that emerges, organically, over the course of struggle. During the general strike movement in BC, no revolutionary organization was able to characterize the events taking place and make demands based on them, save for ancillary propaganda produced by FNAC in the course of struggle, and distributed through May Day speeches, posters, and leaflets. In the absence of a revolutionary organization carrying out intervention in all three of main areas listed previously, striking workers and those supporting them had little alternative but to fall back on the political and labor organizations that were already familiar to them. Due to the failure of revolutionaries to provide accountable leadership based on articulating a shared vision and demands, the workers in struggle were forced to turn to an unaccountable leadership, which based its power on existing institutions and structures. It is essential for anarchist-communists to put forward accountable and revolutionary leadership based on a common analysis and direction put forward by militants and endorsed by those involved in the struggle. Due to the failure of revolutionaries to provide accountable leadership based on articulating a shared vision and demands, the workers in struggle were forced to turn to an unaccountable leadership, which based its power on existing institutions and structures.